1. 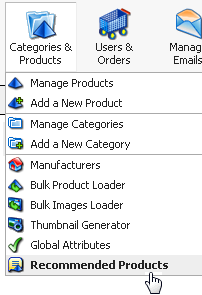 Click on the Recommend Products option under the Categories & Products menu, as shown in the figure below. 2. 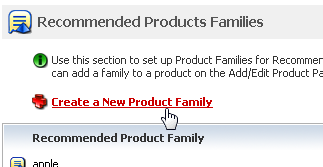 On the Recommend Products Family page, click on the Create a New Product Family link. 3. 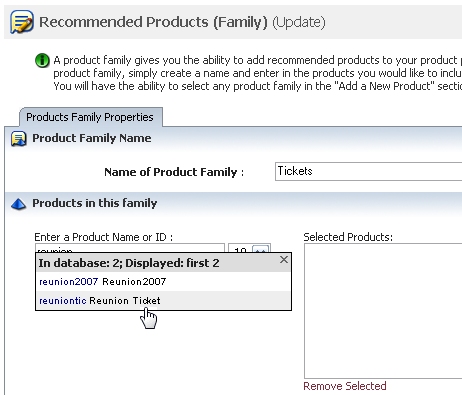 On the Recommend Products (Family) (Insert) page, provide a name for the product family. 4. Enter the product name or ID of the products you would lke to include within that family. The auto-search feature will help you search your products from your Doteasy Cart database. Click on the products to add them to the Selected Products List. Next: Products Management > Product Promotions: "Buy X Get Y Free"